Even before the Second World War came to a successful conclusion the British, Canadian and American armies were giving serious thought to the uniform to be worn postwar. 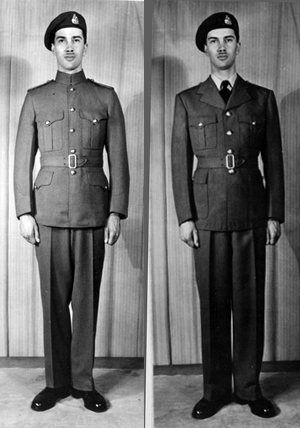 Although both Britain and Canada agreed that Battledress, as well as a tropical uniform, would be retained – with minor changes to incorporate improvements suggested during the war – there remained a focus on a No.1 Dress uniform. This focus reflected the belief that Full Dress and Mess Dress were prewar anachronisms. In fact, the wear of both of these orders of dress had been prohibited at the outbreak of war. 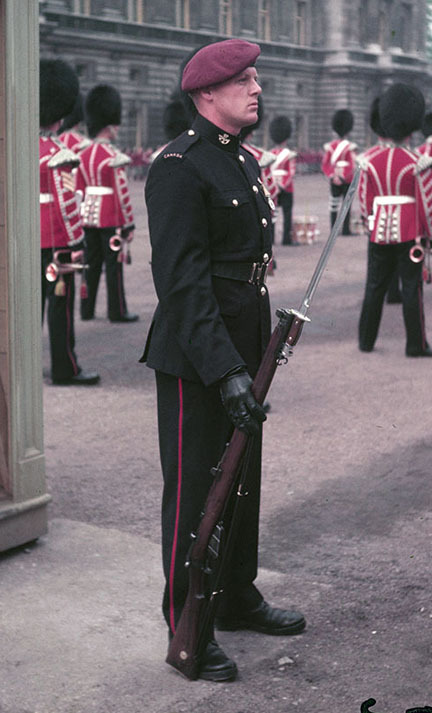 The British proposed uniform (worn here by a Canadian model) was a recycling of the prewar blue serge uniform but with the addition of regimental piping to the shoulder straps. “It will be realized that, owing to the shortage of civilian clothing in this country, it will, in any event, be impossible to introduce a new dress for the army in the near future. It is provisionally estimated that 1st January 1949, is the earliest date when the full requirements of No I dress could be made available. – Highland Units Territorial Army – The matter of Highland Units of the Territorial Army converted to gunners etc is being considered. Insofar as the future No.1 Dress for the Canadian Army was concerned the MGO was considering a number of options. An overview was made available to attendees at the upcoming December 1946, conferences of senior army commanders and of the Defence Association. Possibly the most innovative proposals included these two examples. They differ primarily in the collar styling. Cuffs, shoulder straps and trousers would exhibit regimental colours. Similar in nearly all respects to the blue uniforms but manufactured in brown Barathea or serge. HEADDRESS – The peaked service cap was to be of blue colour with a coloured regimental band. A blue beret was also examined. It was proposed the various headdresses as worn by Highland, Scottish and Irish Regiments would continue to be worn when applicable. Three more propsaed uniforms. Many of these were simply variants on three basic themes – colour, collar and headdress. (a) Collar – The decision as to whether an open collar or stand-up (patrol) collar would be adopted was undecided and a number of prototypes were produced. 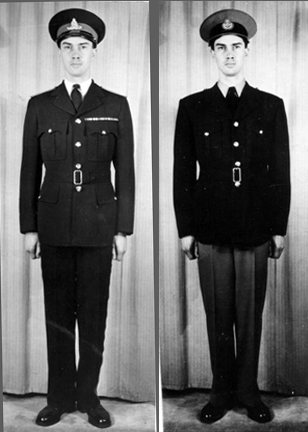 It was proposed that unit collar badges would be worn in either case. The use of coloured regimental piping on the collar edges was also considered. (b) Shoulders straps – The prototypes continued the use shoulder straps and both ‘sewn-in’ and removable were considered with and without coloured regimental piping. It was proposed that unit shoulder titles could be worn in either case. (c) Sleeves – The concept uniforms included the use of regimental buttons and coloured regimental piping on the cuffs with both plain and pointed cuffs proposed. (d) Buttons – Metal regimental buttons were proposed on the various prototypes. (e) Breast-pockets – Prototypes included the use of breast-pockets. (f) Side Pockets – The use of side pockets with and without coloured regimental piping. (g) Girdle and Belt – The use of a regimental girdle (commonly referred to as Stable belts) for wear on ceremonials and the cloth belt to match the jacket for wear when walking out was advanced. (h) Pattern – For Highland and Scottish units it was intended that the jacket be modified for wear with kilts or trews. TROUSERS – The use of coloured regimental stripes or piping in the trousers. SHOES – It was proposed that either shoes or boots may be worn depending upon the occasion. SAM BROWNE BELT – In the case of officers the Sam Browne belt could be worn with the jacket. These two proposals more closely emulated civilian dress. A beret was optionally considered. In any event the final decision would see the elimination of firage caps for Other Ranks and it would be 10 years before these were returned. 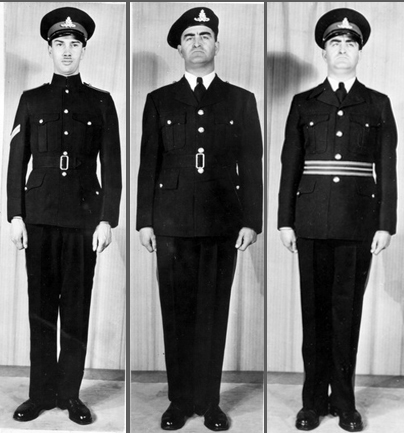 In any event, the final choice was more traditional with the simple blue serge selected but with the use of a coloured beret in lieu of the pre-war coloured forage cap. 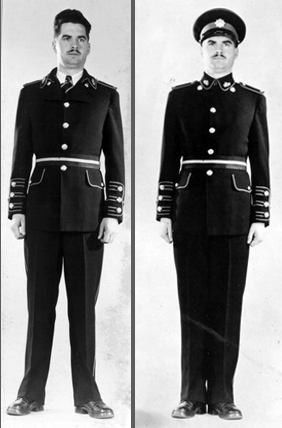 Although a “No.1” uniform is referenced in the 1947 Dress Regualtions there is no description of it. In fact, this order of dress would not be formalised until publication of the 1953 Orders and Instructions for Dress of the Canadian Army. Ironically, where No.1 was intended to replace Full Dress and Mess Dress, both of these orders of Dress made their way back into the Canadian Army – either with official sanction such as for the Brigade of Canadian Guards’ Public Duties responsibilities, or privately funded by Regimental Associations.